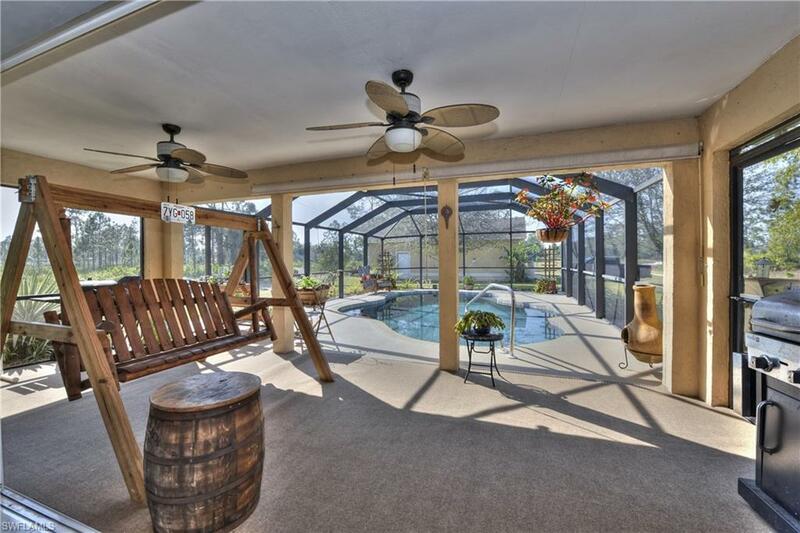 Take a look at this absolutely gorgeous 3/2/2 Pool home sitting on a Â± 1 Acre lot in Lehigh. Unique opportunity to own over 1, 400 SF with tons of upgrades. This split plan w/ vaulted ceilings is only the second house on the street. The kitchen is the heart of the home & boasts granite counter tops, stainless appliances, custom wood cabinets and a deep basin sink, glass top electric stove and oversized fridge with freezer drawer. Just off the dining room, the floor to ceiling pocket sliders lead into the enclosed pool area truly making this feel like your own little paradise. The Large master bedroom has vaulted ceilings, dual sinks, a custom tiled shower, & walk-in closet. Pool bathroom. Hurricane screens, fountain & solar lighting convey. Fruit trees include avocado, oranges, & pineapples. 4 conveniently located Rainwater tanks used to water all of these gorgeous plants. A real man's dream. This home comes with a Â± 1, 200 SF detached garage/workshop with a dedicated AC office space & large roll-up door. Conveniently located near Joel Boulevard & Bell Boulevard. New Roof 2018. HVAC approx. 5 years old. Please note, other listing sites don't include value for Moore Avenue.